Everybody has a father, right? Bounce and Pounce aren't sure about that. Everybody else	seems to have a father except them. In this new story about the Scoot, Scoot Bandicoots® Bounce and Pounce find out about all sorts of different fathers, and get a surprise when they least expect it. 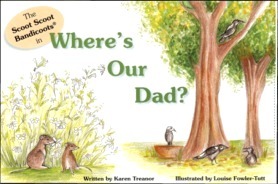 Where's Our Dad? has updated notes on real bandicoots plus a colouring-in page! -- How big a beetle has to be before it's big enough to share. -- Why you shouldn't eat something you find in the garden shed. 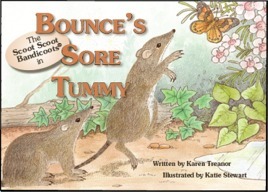 Bounce's Sore Tummy has updated notes on real bandicoots plus a colouring-in page! Even the smartest little bandicoots can get into trouble. Why won’t Pounce’s new friend come home and meet Mum? What’s happened to Baby Jack? And why doesn’t Bounce want any of Kerry Kookaburra’s play lunch? Book III in the adventures of the Scoot, Scoot, Bandicoots ® is sure to enthrall young readers. With updated notes on real bandicoots and a colour-it-yourself page. Bounce is in trouble again—a whole bucketful of trouble. The little bandicoot’s liking for strawberry jam has landed him in a mess, and it looks as if he won’t be able to get out of it. Perhaps he should have listened to his sister about not getting into things you aren’t sure you can get out of. Why is Grandpa Bandicoot so grumpy? Bounce and Pounce want to help make him feel better, but it seems that everything they do is a disaster. After a lot of mistakes they finally discover what’s really wrong and how to put it right. 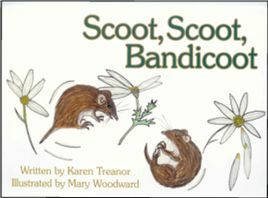 Based on real-life observations of these little known Australian marsupials, “Scoot, Scoot Bandicoot ® will charm beginning readers and teach them something about how bandicoots live. 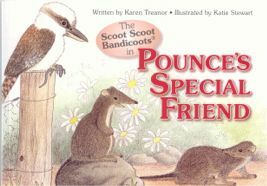 We know you will enjoy the Scoot, Scoot Bandicoot book series by Australian children's author, Karen Treanor. Please vist the bandicoot diary pages for entertaining stories of our about bandicoots. You may also want to visit some of our children's link partners on our links page. 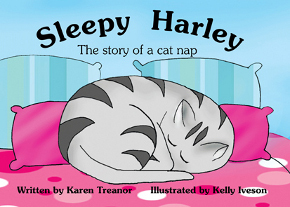 If your children enjoyed "Scoot, Scoot Bandicoot"series but found the reading level a bit beyond them, "Sleepy Harley" might be just the book you've been looking for. It's suitable for children aged three to seven. Harley is a little cat who has been left outside accidentally. He is very tired and wants to find a place to sleep, but nowhere is just right. Follow Harley through Bayswater as he searches for a place to take a nap. 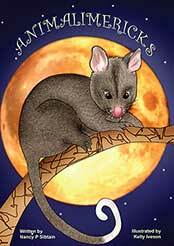 Written by Nancy P Sibtain, the clever compiler of cryptic crosswords for the Sydney Morning Herald and The Age, this book of limericks about native Australian animals is colourfully illustrated by Kelly Iveson, who did the pictures for Sleepy Harley. 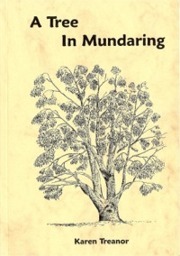 Suitable for reading to the very young, and for slightly older children to read for themselves, this large format book will become a children’s classic. What started with two suburbanites lost on the back roads turned into a 20-year love affair with the beautiful and ever-surprising Perth Hills. This collection of short stories about enterprising bandicoots, predatory possums, and the biggest spiders outside a nightmare will amuse and entertain readers of all ages. The Angelus Ghost is a romantic mystery with a dash of history, now in its third printing. Suitable for ladies of quality from 15 to 95, the story features a heroine smart enough not to go into a spooky cellar without a light and a derringer! Nothing in her nursing training prepared Tara O’Neill to be a ghost hunter --but then she came to Angelus. Even as western Ireland welcomes in the twentieth century, events from long ago cast chilling shadows over Angelus House, scene of many dark and bloody deeds, where unexplained ‘accidents’ are threatening the life and sanity of Meade Castlereagan. The villagers say the house is haunted; Meade’s husband thinks she’s imagining things; but Tara believes there’s something truly evil roaming the dark halls. Can she convince anyone else before another murder is done? 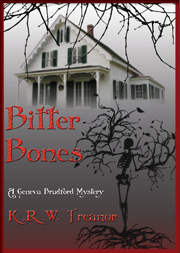 Torn between her duty to her patient and the amorous attention of two attractive men, Tara grits her teeth, loads her derringer, and sets out to find The Angelus Ghost. Homesick? Heimwee? We've got the antidote. 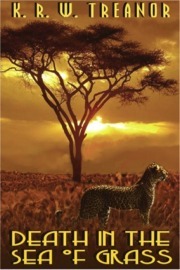 Nostalgia buffs, homesick old Africa hands and fans of the Golden Age of murder mysteries will enjoy this book, set in southern Africa in 1935. Stolen diamonds, mysterious Nazis, a refugee artist , a hidden sniper, and a modern but powerful queen keep the story moving at a leopard's dash from start to finish. 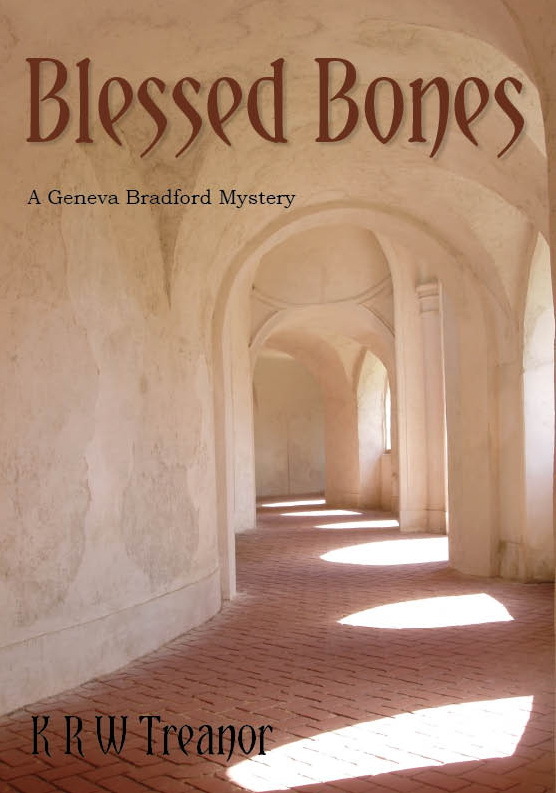 In this second book in the Geneva Bradford series, Geneva is worried by a stranger who's taking an interest in her family. When he turns up in somebody else's tomb, Geneva and her children are on the suspect list, especially when it seems they might have something to gain by the stranger's death. In Geneva Bradford’s third adventure, she answers a call for help from her oldest friend, now the headmistress of a girls’ school. One of the other teachers has been attacked and left unconscious, and not only does Jessica need help to find out who did it, she needs a substitute teacher. 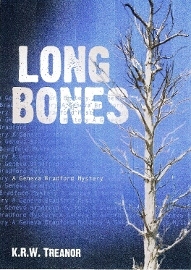 Anyone who has read the previous books in the series will know of Geneva’s penchant for finding long-dead bodies, and won’t be surprised at what happens next. Bandicoot Photos feature the lovable marsupial the bandicoot, also known as the isoodon obesulus. 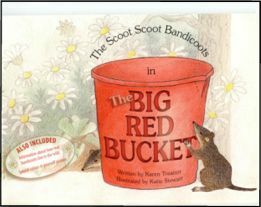 Read reviews of the Scoot, Scoot Bandicoot book series for children. The Scoot, Scoot Bandicoot book series as individual books or as a set.